The fire burning in South-Central Los Angeles illuminated the rage, anguish and despair of African-Americans consigned to bleak lives of poverty and hopelessness by the most "advanced" country in the world. But as history attests, once the rage subsides, the images, which should be unforgettable, are all too soon forgotten. The ghetto and those trapped inside it are once more invisible. The Rodney King beating, captured on videotape and shown around the world, was a rare exposure of the reality of summary police "justice" visited on African-Americans on the streets of this nation. Perhaps in the belief that such a graphic glimpse would shock the national conscience, blacks patiently allowed "the system" to run its course. For months preceding and during the trial, despite almost daily provocations and despite constant television rebroadcasts of the vicious beating, not a match was struck, not a store window broken nor a business looted. The black community of Los Angeles, and not only of L.A., kept its cool. But once the jury acquitted the policeman after only one day of deliberation, the ghetto exploded. Fires were set, motorists pulled from their cars and beaten, stores looted. No doubt gang members were involved in the looting but to try to reduce the riots – as some have done – to gangs and depraved elements seeking to enrich themselves is to reveal a cynical indifference to the despair. Neglected, unorganized, unrepresented, lacking a coherent, progressive national leadership, looting and violence appear to many blacks to be the only way to let whites know how biter they are. "I know it’s my neighborhood that’s burning," said a 55-year old black worker, "but if I’ve got to do this to make you listen, I’ve got to do it. A lot of people are crying out, reaching out." In an attempt to use the riot as a racist centerpiece for his re-election campaign Bush assigned the blame to the social programs enacted in the 60s and 70s. Welfare, which encourages sloth, dependency and lassitude, is the culprit. Let them go hungry – out of sight, of course. When that didn’t sit as well as he had hope, he unearthed anti-poverty "expert," Jack Kemp, to unveil his pitiful laissez faire program for economic uplift of the poor, cloaked with the populist mantle of "empowerment." "Enterprise zones," allowing the poverty-stricken to buy their own apartments in public housing projects, and education vouchers. What Bush calls, in the vulgar vernacular of the capitalist hustle, "a piece of the action." A tiny piece, to be sure. And the Democratic contender? What has Bill Clinton proposed. More of the same platitudinous generalities – hope, faith and charity. (Not too much of the last.) His one concrete suggestion is to increase the minimum wage automatically each year to keep pace with inflation. That would net the lucky recipients a solid increase of about 18 cents an hour in 1993. The riot’s toll was terrible – 58 lost their lives, 9,500 were incarcerated and there was $1 billion worth of damage. That black rage turned indiscriminately on whites, that it turned inward on its own community, wreaking such havoc and destruction was tragic. But white America got the message. That 81-second videotape of the police beating, broadcast over and over again, forced whites to confront the terrible injustices inflicted on blacks. Unlike Watts and other riots that centered on the miserable conditions of life for blacks, this time the explosion was sparked by mistreatment so gross and so visible, it could not be overlooked. Perhaps out of fear over the fire next time spreading to their suburban enclaves, whites have indicated a change of heart. For the first time, a clear majority believes that the country is spending too little on improving conditions for black Americans and that investing in jobs and job training programs is a better way of preventing future turmoil than police repression. A more benign explanation may well be that working- and middle-class whites, suffering the effects of a failed economy – losing their jobs, their homes, many forced into personal bankruptcy – can relate to black deprivation with greater understanding and sympathy. The explosion in South Central Los Angeles underscores the urgency of affirmative action, including quotas and racial preferences for African-Americans. It is an economic and social imperative. That both political parties have failed black America comes as no surprise. So have the unions. Liberals and what there is of a left, for the most part, have deserted their commitment to racial injustice and affirmative action in their headlong rush to support Democratic Party candidates, no matter who. To that end they are ready to sacrifice black demands for racial equality. For years they have devoted themselves to reforming the Democratic party. To what end? The Democratic Party, committed to the politics of austerity, is less responsive today to the needs of the poor, minorities, women, the beleaguered trade unions than it was 30 years ago. Its role in the S & L bailout (speaking of looting!) is practically indistinguishable from the Republican Party’s. Not only has it failed to press for the "peace dividend," the Democrats vote billions for military spending and to restore funds for military hardware that even the Pentagon is prepared to cut. The liberal-left’s efforts to reform the Democratic Party, far from resulting in the party’s transformation has, sadly, succeeded in conservatizing the reformers. The absence of an electoral alternative today, when it might well have reaped the rewards of Bush’s vulnerability, was insured by the left’s failure to pursue the path of independent political action yesterday. Popular disenchantment with both Republicans and Democrats, coupled with demands for more comprehensive social programs, open the possibility of a positive response to a left appeal and the creation of a viable independent alternative tomorrow. 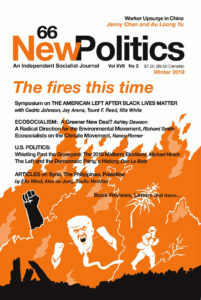 PHYLLIS JACOBSON is co-Editor of New Politics.